I'm 36 weeks pregnant. I cannot believe that I'm writing yet another one of these updates already. The weeks seem to be flying by although I've heard that around about this stage is where it begins to drag a bit. Morning sickness is back with a vengeance. I don't want to eat anything other than snacks, my heartburn appears after I eat literally anything and I have been sick. It feels like I'm right back in the first trimester. I did have a little visual disturbance last Tuesday. It was exactly the same thing that happened with my pregnancy with C so naturally, I panicked. I cried. Chris urged me to phone the maternity unit but I hate being a hassle especially if nothing is wrong. I tested my wee with my Ketostix and only found a trace of protein so I wasn't convinced that my vision problems was due to pre-eclampsia. I phoned maternity anyway just to put my mind at ease and she said that because there is no protein and the fact that I had been vomiting earlier in the day, that it could just be down to dehydration. I kept drinking lots of water throughout the night and was absolutely fine. I think I just panic too much over the slightest thing and I'm comparing every little symptom to my last pregnancy. I'm really uncomfortable now. It hurts to even sit no matter what position I'm in. My hands and feet are swelling slightly and I've had to remove my ring - boo :( I've found that my socks are leaving marks on my new-found cankles! We had a scan on Thursday and the baby is weighing roughly 5lbs 4oz. Her length is around 47cm. I do feel like she is moving lower and lower - it really does feel like sometimes she might fall out! I constantly feel like I need to wee but by the end of this week I'll have a full-term baby. How scary is that!? The end is near! 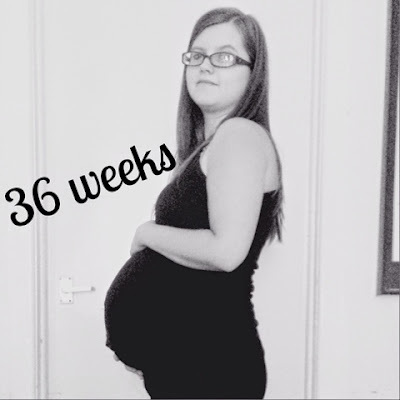 2 comments on "My Second Pregnancy: 36 Week Bump Update"